I usually keep my thoughts of economic doom and gloom to myself, but John Starkweather posted a link to this on Facebook, and I had to share. Chris Wilson of Slate has posted an interactive map of where jobs have been gained and lost across the country since January 2006. The map’s dates start with January 2007, and when each button is pressed they show respective losses or gains for each month throughout the previous year. Only counties with a gain or loss of 250+ are represented by a red or blue dot. Using the Labor Department’s local area unemployment statistics, Slate presents the recession as told by unemployment numbers for each county in America. Because the data are not seasonally adjusted for natural employment cycles throughout the year, the numbers you see show the change in the number of people employed compared with the same month in the previous year. 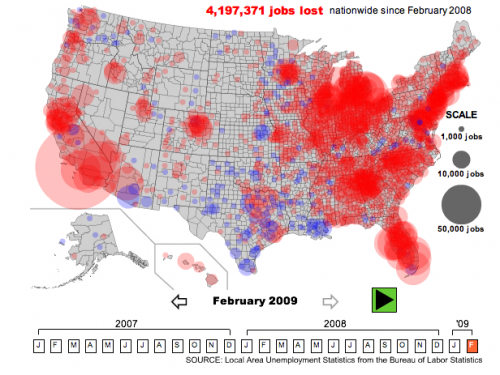 Blue dots represent a net increase in jobs, while red dots indicate a decrease. The larger the dot, the greater the number of jobs gained or lost. The country as a whole looked pretty good in January 2007; granted, there were some red (job-loss) areas across the country, but for the most part blue (job gains) dominated. Keeping things local, Tom Green County (San Angelo) saw a gain of 256 jobs. Clicking the green play button takes you through a completely disconcerting and ultimately heartbreaking animation showing how jobs have simply disappeared across the country – over 4 million at the last count (but actually over 5 million now, according to the article). Once again, keeping it local: Tom Green County now shows a loss of 736 jobs since February 2008. For a moment, I was heartened that Sutton County (Sonora) showed a job gain of 530 jobs since February 2008, but then I realized why. Last year this area was going though an oil boom, which has since gone bust. I guarantee that when they get to the September 2009 numbers, they will read much differently, as that’s when the oil companies started laying people in this area off in earnest. Link: When Did Your County’s Jobs Disappear?